Sathiguru Paatshah Arjun Dev Ji Maharaj is speaking in Bilaaval Raag through this shabad. The shabad begins with the lines of rehaao. As we have mentioned before in hukamnama kathas, the rehaao lines in a shabad are like the centre of the flower. The rest of the shabad is like petals surrounding the centre of the flower. The fragrance, the essence of the shabad is contained in these rehaao lines. 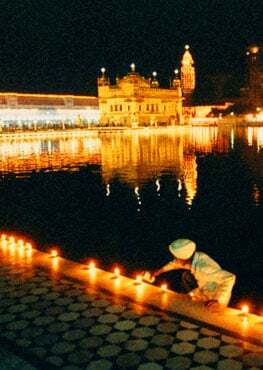 Simran is that stage of remembrance, when you remember Waheguru at all times. Kaliaan means liberation, emancipation, realisation. How was I liberated? Gobidh simar. Bidh means seed, go means the world; The seed of this earth, The Creator. By simran, by meditating upon The Lord, I have been liberated. That is how you find liberation, through Waheguru Ji's simran. There is no other path to liberation, there is no other path to emancipation. Guru Ji says gobidh simar, meditate upon Gobidh, The seed of the universe, upon Waheguru, upon The Creator of this universe. That is how you will be liberated, that is how you will find true peace. Mittee oupaadhh. Oupaadhh means all these illnesses which are attached to me - worries, anxieties, desires, greed, anger, being attached to this world. All of these have mittee, have gone. Bhaeiaa sukh saachaa - I have found true sukh, true happiness. Not false happiness of the world which remains for an hour, or a few days, or a few minutes, not fleeting happiness, but eternal happiness. How can you find this eternal happiness, how can you find this internal peace? A(n)tharajaamee simariaa jaan. When you simariaa, when you meditate, when you call out to, when you chant The Name of That a(n)tharajaamee, That knower of all hearts. In jaan, the 'naanaa' (punjabi alphabet letter) has an aonkarr here, that means sujaan Waheguru, The One Who knows everything, The One Who is wise, The One Who knows everyone's heart. Rehaao - Guru Ji says pause and think about this. Jis kae jeea, The One Who has created the jeea, The One Who has created all the beings; thin keeeae sukhaalae, He is The One Who gives them this sukh. When someone realises this state of realisation, when someone is emancipated, when someone is liberated, when someone achieves this spiritual height, they don't say "I have achieved this." No, they say that Waheguru Ji created them, Waheguru Ji blessed them with this inner state of peace. bhagath janaa ko saachaa thaan. I have the true support, I have true strength, thaan. I don't have the flase strength of my arms which will last for maybe a few years, I don't have false strength of money which will last as long as I have a few dollars, a few pounds or a few rupees. I have true support, I have true strength. Bhagath janaa, those people who are bhagath, who are devotees of God, those people who are in love with God, they have true strength of God's Name. That strength cannot be taken away. Your arms may be cut down, your money may be set on fire, but your love for God will never go. That will always be your inner strength, leading you on. That person in the stage of realisation says, Waheguru Ji looks after His dhaas Himself. He raakhee, He protects His dhaas, His servants Himself. Bhai bha(n)jan oopar karathae maan. Waheguru Ji bha(n)jan, bha(n)jan means the destroyer, bhai means fear; The destroyer of all fear. Guru Ji says that I put all of my faith, I put all of my love into That karathae, into That Waheguru. I take no-one else's support now. My support is only That karathaa, That Waheguru. Maan means to put your support, to put your faith into someone. I don't put my faith into anyone else, I put my faith into The Creator of this world, The destroyer of fear. Bhee mithraaee. Wherever I go, I see friends. Like Bhai Ghanaiyya who sees friends wherever he goes. No enemies and no otherness. bhee mithraaee - I have found true friendship, wherever I go, those who were once my enemies have become my friends. My body was my enemy, it was taking me upon the wrong path, now it's become my friend, now my mind is under control, it listens to me. First my mind was my enemy, now its become my friend, mithraaee. Mittee buraaee, all of the evilness in my heart has gone, all of the badness has gone. dhraasatt dhooth har kaadtae shhaan. Waheguru Ji has uprooted the enemies of desire, anger, greed, attachment, lust from inside me. Ghanaerae means lots of, limitless. I have found limitless aana(n)dh, limitless ecstasy, I have found limitless peace, limitless sehaj - an inner state of being where nothing can touch me, no happiness, no sadness can come near me. I am in a state of eternal never-ending ecstasy now. Naanak jeevai har guneh vakhaan. Guru Arjun Dev Jee says my life comes from vakhaan, from chanting the guneh, the praises of Waheguru Ji. That is what I live for, that is my life - to chant the praises of That Waheguru Who has liberated me and given me eternal peace.